Fire Combat offers a range of standard and customized firefighting skid units to meet the needs of nearly any fire fighting application. 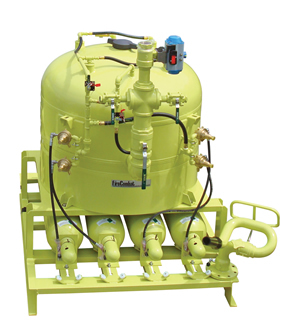 Our skid-mounted fire suppression systems are designed and built to fit most standard truck beds. Custom sizes and configurations are available for OEM requirements. 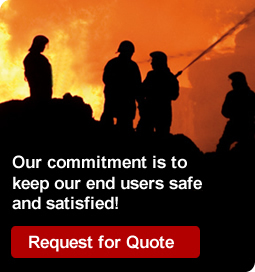 We offer both stationary and mobile dry chemical extinguishing systems. These completely self-contained units can be custom-sized to your fire suppression needs, with maximum agent capacity up to 4,000 lbs. Our dry chemical fire suppression systems are compatible with numerous dry chemical chemistries. Our compressed air foam system (CAFS) technology utilizes medium-expansion foam for rapid flame knockdown and fire suppression. Compact and fully self-contained, these firefighting skid units can be placed in the field or truck-mounted. Rugged construction and durable components ensure long service life. Halotron portable fire suppression systems are reliable, effective, and environmentally-acceptable replacements for truck-mounted Halon 1211 devices. A wide range of customizable options make it easy to put together the perfect fire fighting unit for your specific application. Fire Combat’s twin agent fire protection systems use Class BC dry chemicals and aqueous film forming foam (AFFF) for fast and efficient fire suppression. 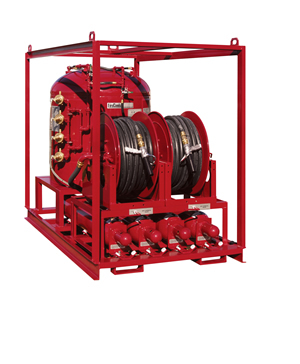 These fully self-contained firefighting skid units are designed for use by a single operator.